The joyous festival of Christmas (December 25th) is celebrated each year by millions of people all over the world. Marking the birth of Jesus Christ, it is the last and most important of the four traditional "quarter days", signalling the beginning of each quarter of the year and welcoming each of the four seasons. These holidays were communally celebrated during the "Age of Faith", reassigned from already established astrologically-based pagan festivities. The other quarter days are Lady Day (Annunciation) on March 25, St John the Baptist's Day on June 24 and Michaelmas on September 29. Rob Tillett explains the meaning of this festival and puts it into an astrological context. December 25 marks the official commemoration of the birth in Israel some two thousand years ago of Jesus, the Divine Child. Jesus, son of Mary and Joseph, who became Jesus Christ ("the anointed"), was the source of the Christian faith, but thanks to the spread of Western Civilisation, it has come to be a general time of feasting, gift-giving and celebration for people all over the world, of all cultures and faiths. As it actually happens, this date has long been a time of celebration in all cultures since prehistoric times, well before the birth of Christianity. Jesus was a vastly influential figure – the year of his birth is defined as year "1" and marks the beginning of the current Western Gregorian Calendar. There is considerable controversy about the actual year of his birth (year "1" is not considered by scholars to be the true year of his birth), but that lies beyond the scope of this article. Jesus Christ is revered by Christians as the true saviour and Son of God, so, in Christian civilisation, his birth marks the beginning of a new world for mankind. Christmas essentially celebrates the birth of the Divine Spirit in human form, the salvation of souls lost in the material world. Jesus, the Incarnation of Spirit, is said to have been born in a stable, in Bethlehem (now part of the Palestinian Territories), accompanied by angelic proclamations and miraculous portents – not the least being that his mother, Mary, is believed to have been a Virgin – esoterically standing for the sign of Virgo. Thus is the Divine brought forth from Nature! His birth is also said to have been marked by the appearance of a marvellous star, the Star of Bethlehem, which was followed by three Wise Men (Magi, or Astrologers) from the East, who brought gifts to mark his birth. The powerful astrological key to these and other related symbols is explained in an excellent and thoroughgoing monograph by Mike Magee. This archetypal celebration has also spread to many non-Christian cultures as well, for the pleasures of gift-giving and feasting are universal. No doubt the commercial pressures of a consumerist society have seen to that! But does this festival really mark the anniversary of the miraculous birth of the baby Jesus, celebrated by angels, shepherds and wise men from the East, or is it fundamentally a celebration of something else? In the New Testament, the holy book of the Christians, there is no actual mention of the date of the birth of Jesus and the primitive church did not celebrate it. The shepherds of Luke's gospel (Luke 2:8) were said to have been minding their sheep in a field when they received the angelic proclamation of his birth. 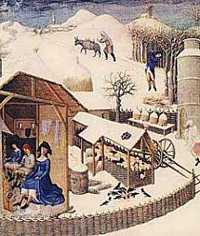 It is therefore unlikely that the birth of Jesus could have happened on December 25, for at that time all would have been wrapped up in a warm barn, the wintry weather being too cold for them to be out in the elements. Why then was December 25 chosen as the day for Christmas? Here we have to look more deeply at the customs, religious practices and celebrations of the time. At the beginning of the Christian Era, the Roman Empire was the dominant force in Europe, the Middle East and the world of the Mediterranean. Rome followed a pagan religion of many gods and goddesses, including Jupiter, Venus, Mercury, Mars, Saturn, the Moon and the Sun. There are many myths and legends that tell the stories of these gods and heroes, really a coded set of narratives that reveal much about the ancient cultures and their approach to life, the universe and everything. Life in ancient times was far more dependent upon the seasons and the natural cycles than we are in the West today, cocooned as we are in our electronic villages, turning night into an interminable electric day. During times when people could actually see the stars in the night sky, astrology developed as a mode of making sense of these natural cycles and certain times in the year were seen to be especially significant. Key times for celebration were the cardinal points of the seasons, the solstices in June and December and the equinoxes in March and October. These temporal points were utterly central to the the social mores of the ancients, as they not only measured the seasons, the sowing and reaping of crops, but also symbolised stages in the development of the soul. These calendrical festivities were seen as times when the fabric of the cosmos was loosened and the hand of divine providence could be moved to take a more active part in the lives of those who lived on the body of Mother Earth. The solstice at Christmas time marks the entry of the Sun into the sign of Capricorn, the sign ruled by Saturn. On this day the Sun appears to halt over the tropic of Capricorn for three days and then begins his journey North, marking the return of glorious light to the darkness of Winter in the Northern Hemisphere (Capricorn was known to the ancient Greeks as the Augean Stables – so effectively the Sun is born in a stable). Janus is said to have instituted the Saturnalia leading up to the solstice as a yearly tribute to his friend. For mortals, the festival provided a yearly symbolic return to the Golden Age. Thus, it was an offence during this period to punish a criminal or start a war. The meal normally prepared only for the masters was prepared and served first to the slaves by the masters. All people were equal and, because Saturn ruled before the current cosmic order, Misrule with its lord, Saturnalia Princeps was the order of the day. Children and adults exchanged gifts, but the adult exchange became so great a problem — the rich getting richer and the poor getting poorer — that a law was enacted making it legal only for richer people to give them to poorer. This custom is still in theory celebrated on Boxing Day, the Feast of St Stephen, when gifts are boxed and given to the poor, who are also due to be given food. So we see that the Saturnalia was a festival of feasting and celebration, very popular in Roman times. The season began with the Consualia, on December 15, marking the end of the sowing season, then around Dec 17 got into full swing with the Festival of Saturn (agriculture) followed on the 19th with the festival of Opalia (honouring Mother Earth, Saturn's wife). The general festivities continued until December 25 (the solstice in the Julian calendar). This was formalised during the Empire as a full week of festivity. The solstice was celebrated throughout the ancient world in one form or another. In particular, the Romans honoured the rebirth of the Invincible Sun with the festival Dies Natalis Solis Invicti on December 25th, the first day after the Solstice to lengthen noticeably. Quite a few other notable births were honoured at this time, including a selection of Solar Heroes: Horus; Attis; Mithras; Osiris; Baal and so on. The winter solstice was honoured in the pagan mysteries as the birth of the Divine Child, Sun of Righteousness, Son of Man, Light of the World etc. Christmas Eve, the night before the solstice, was honoured as the Night of the Mother, matrum noctem. When Christianity was adopted as the official religion of the Roman Empire in the 4th century, the need for a formal celebration of the birth of the redeemer became critical. Because the people were used to celebrating the birth of the Sun on December 25, this was adopted by the Church in the West as the official birthday of Jesus. Eastern churches did not accept this until quite some time later. Northern cultures celebrated Yule (birth of the child) at this time, from which many of the trappings of the modern Christmas celebrations have developed (for a fascinating exposition of this, see Alexander Hislop's The Two Babylons, which though written from a distinctly puritanical viewpoint, is full of revealing scholarly research). Indeed, most of the symbols and emblems of Christmas have been adopted wholesale from earlier and often competing pagan traditions, including the Virgin Birth, the Christmas Tree, gifts, lights, decorations, mistletoe, holly, carols and so on. For a detailed examination of some truly striking parallels, check out M. D. Magee: Christmas. Traditional Christian churches celebrate Christmas as a phase, the first season of the liturgical year, rather than simply as one single day. The Christmas Season begins four Sundays before Christmas on the first Sunday of Advent (adventus, "arrival" or "coming"), preparing the faithful for the coming of Jesus. Advent ends on Christmas Eve (ancient days were reckoned from evening to evening, rather than from midnight to midnight as we do now). Christmastide itself begins on the evening of Christmas Eve and lasts for twelve days until the festival of Epiphany on January 6th. Following ancient custom, the evening of January 5th is Twelfth Night, but the Twelfth Day can either precede or follow the Twelfth Night according to the Christian tradition followed. Epiphany marks the climax of the Christmas Season and the Twelve Days of Christmas. Twelfth Night still remains an evening of feasting, with a special King's Cake as part of the festivities of Epiphany. The Christmas Season closes on the Sunday following Epiphany, although some hold that it should properly end at Candlemas, on February 2nd. 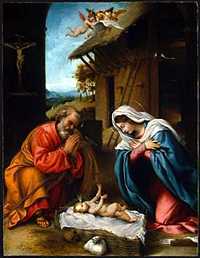 Many church leaders have fulminated against the overtly pagan nature of Christmas over the years. Puritans even tried to ban it, but this ban was shortlived in England (1644-1660) though slightly longer in Massachusetts, where it lasted until 1681. Notwithstanding, Christmas is a seasonal celebration of the rebirth of the Sun at the deepest night of the solstice, so is ingrained into the cultural soul of our civilisation and consequently has proven impossible to erase. People have celebrated the birth of the Unconquerable Sun with gift-giving and feasting for thousands of years. Whether or not the contemporary commercialisation of this spiritually significant time is a good thing is entirely another matter and one which thoughtful people must decide for themselves. Merry Christmas, then, and have a cool Yule! This video is in 3 parts. When it ends you can select part 2, then part 3. NOTE: in southern latitudes, of course, the solstices are reversed, so that the mid-winter character of Christmas in the Northern Hemisphere becomes a hot mid-summer celebration in Australia, South Africa, South America, New Zealand and other places south of the equator. Naturally enough, the mid-summer celebrations in June become mid-winter chills down south! This presents something of a problem for Christianity and for Astrology, or any other seasonal philosophy with claims to universality, a question which is partially addressed on this site in Ian Thurnwald's article on the Elemental Qualities, the building blocks of astrology. However, the tropical zodiac seems to delineate cultural forms (archetypes) within the Cosmic Mind. Our connection via the collective unconscious enables us to interpret these forms using astrology, even though the physical seasons may not actually comply with the symbolism.